Bandai's official youtube channel has posted the promotional video for the soon-to-be released DX Jikuu Driver, Kamen Rider ZI-O and Kamen Rider Geiz's transformation belt in the upcoming Kamen Rider ZI-O TV series. 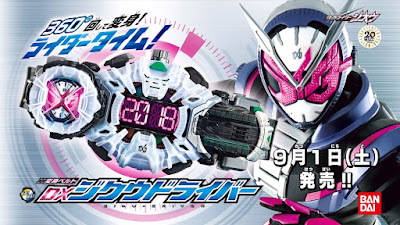 The DX Jikuu Driver will also include the DX ZI-O Ride Watch and is set to be released on September when the series finally airs and will cost 7,500 yen and will also have a set that includes the DX Ride Watch Holder and DX Geiz Ride Watch for 10,500 yen. You actually spin the driver around? Ok this belt looks really cool. Okay, I wasn't sure about the whole spinning thing, but seeing it in action has changed my mind! It's awesome!